It’s easy to fall into the trap of believing that we’re alone in having a certain problem, need or deficiency. You’re not alone! 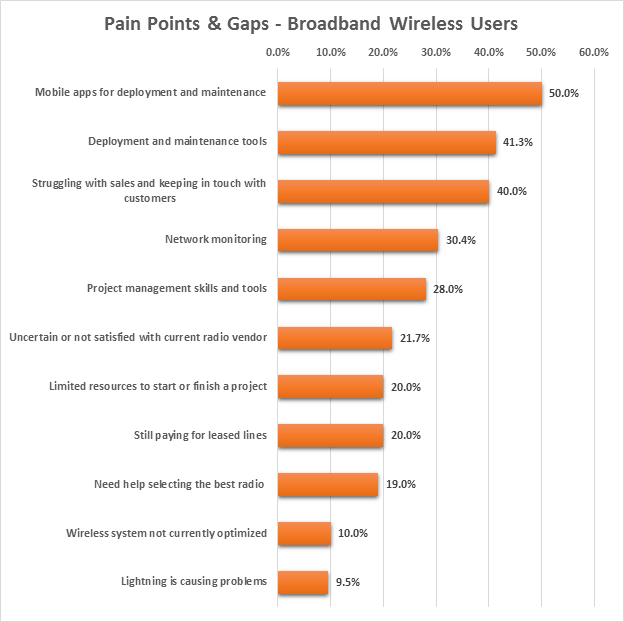 This summer we surveyed hundreds of broadband wireless professionals in an effort to understand some of the largest gaps and pain points in the industry. The professionals surveyed included end users in the public safety, energy, utility, broadcast, telecom and cellular sectors. As well as an equal number of equipment resellers and distributors. I wish we could create dialog with everyone that reads this post to see if these items resonate, and perhaps identify other gaps. Castle Rock Microwave is working to solve many of these problems for ourselves and our customers. Some solutions we have are through partnerships and others through innovation and invention of our own. We want to help make your life easier! Do these pain points and gaps resonate? I’d love to hear from you! Please leave a comment below.